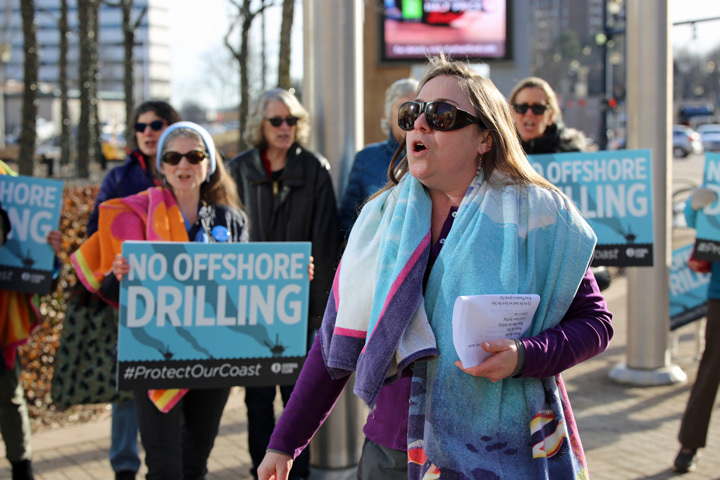 HARTFORD, Conn. (CN) – Connecticut activists who have teamed up with environmental advocates up and down the East Coast to oppose plans to explore and drill for oil in the Atlantic Ocean protested Tuesday outside a meeting for public comments on the controversial proposal. Martha Klein, president of the Connecticut chapter of the Sierra Club, rallies environmentalists outside the Hartford Downtown Marriott on Tuesday during a Bureau of Ocean Energy Management meeting on offshore drilling. (Photo by Christine Stuart/CNS). President Donald Trump’s administration announced last month that it was considering a five-year plan to open up federal waters to drilling. That was a wake up call for Connecticut and other East Coast states. About 50 activists rallied Tuesday outside the Hartford Downtown Marriott, where the U.S. Interior Department’s Bureau of Ocean Energy Management was holding a public meeting to accept comments about the proposal. Connecticut doesn’t border the Atlantic Ocean or any federal waters, but the first national marine sanctuary is directly east of the mouth of Long Island Sound along the state’s southern border. In addition, the Northeast Canyons and Seamounts Marine National Monument off the coast of New England is home to numerous rare and endangered species, including Kemp’s ridley sea turtles, deep-sea fish and corals, as well as three species of whales, including the North Atlantic right whale. Connecticut environmentalists worry all that would disappear if companies were allowed to explore or drill for oil in the Atlantic. Inside the hotel, William Y. Brown, chief environmental officer for the Bureau of Ocean Energy Management, said Tuesday that his agency is looking at a “potential exclusion” for the submarine canyons that stretch as far north as Maine and as far south as Virginia. Bureau of Ocean Energy Management employees were available Tuesday to members of the public who had questions about the proposal, which is still in its very early stages. Comments will be accepted on the agency’s website until March 9. So far, more than 160 East Coast municipalities and over 1,200 local, state and federal elected officials have opposed offshore drilling and seismic airgun blasting, which is used to explore deposits. In addition to Malloy, the governors of Massachusetts, Rhode Island, Delaware, North Carolina, Virginia and Maryland signed onto a Jan. 17 letter to Interior Secretary Ryan Zinke. The offshore drilling proposal is also opposed by Connecticut’s U.S. Senators Richard Blumenthal and Chris Murphy, both Democrats. According to conservation group Oceana, numerous fishing and tourism interests, including local chambers of commerce, tourism and restaurant associations, and an alliance representing over 41,000 businesses and 500,000 fishing families from Florida to Maine, also oppose oil exploration or development in the Atlantic. The South, Mid-Atlantic and New England Fishery Management Councils have all expressed concerns about the risks posed by seismic surveys and oil and gas development to managed resources, fisheries and coastal communities along the Atlantic coast. According to the Interior Department, an estimated 3 billion barrels of oil lay beneath the coastal waters of the United States, plus 30 trillion cubic feet of natural gas.